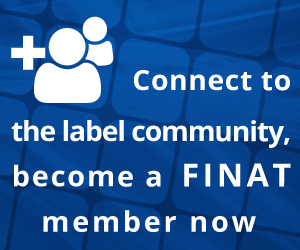 The FINAT Label Competition recognises and highlights the advantages and uses of self-adhesive labels and flexible packaging as an effective marketing, promotional or identification tool. The annual competition showcases the best of self-adhesive label print. As of 2018, the competition will also promote the use of narrow web flexible packaging (press width up to 570mm) as an additional product range for label printers. It recognises and rewards achievement in terms of both end use/ marketing impact and print and converting quality. Awards are given – by a jury of leading industry experts - in the main segments where self-adhesive labels and flexible packaging are used: alcoholic beverages, food, household, industrial, cosmetics, pharmaceuticals, security labelling, (self-) promotion, and booklet/coupon labels and for the major reel-fed print processes: flexo, letterpress, screen, offset, gravure, digital print and combination print. The 2019 competition is open to receive entries till 15 March 2019. Details can be found in the brochures (English, French, German). Click here to access the online registration form (in English only). Best in Show, Group A (Marketing/End-uses) and Category A2 (Alcoholic Drinks) winner: Multi-Color Corporation North America Wines & Spirits for 'Sidewinder Spirits'. Group B (Printing Processes) & Category B5 (combination printing) winner: InForm Etiketten, Germany for Spirituosenausstattung Edelbrand Liebl. Group E (Digital) & Category E1 (Toner Technology) winner: Etiketten CARINI, Austria for 'Lemberger' Gin"
The L9 World Label Awards is a global competition in which currently six continents are participating: USA (TLMI), Japan (JFLP), Europe (FINAT), Australia (FPLMA), New Zealand (SALMA), and India (LMAI). In order for companies to compete and to win an award, their entry has to win a prize in their own local label awards competition first, eg TLMI , FINAT, FPLMA, JFLP, SALMA, or LMAI. Each Association (Chairman of the jury) then selects entries for the WLAA from their nominated or winning entries, which are judged and possibly rewarded with the World Label Award.